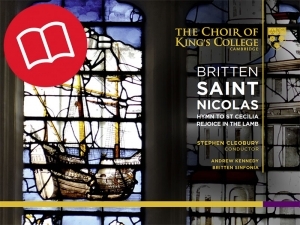 The Choir of King’s College, Cambridge under conductor Stephen Cleobury presents Britten’s enchanting choral masterpiece, Saint Nicolas, with Hymn to St Cecilia and Rejoice in the Lamb, celebrating 100 years since Benjamin Britten’s birth. The recording features soloist Andrew Kennedy, a former Choral Scholar at King’s College, Cambridge, the renowned Britten Sinfonia, Sawston Village College Choir and Cambridge University Musical Society. This was the first recording on the King’s College own label to be released in surround sound, capturing the unique acoustics of King’s College Chapel. The two-disc package comes with a standard CD and an SACD containing high definition stereo and 5.1 surround mixes. Disc One (standard CD) contains 44.1kHz 16-bit stereo audio. Disc Two (Dual Layer SACD) contains high-resolution stereo (2.0) and multichannel surround (5.1) mixes. Recorded at 96kHz 24-bit PCM in the Chapel of King’s College, Cambridge, by kind permission of the Provost and Fellows, 23-24 June 2012 (Hymn to St Cecilia & Rejoice in the Lamb) and 14-15 January & 20 May 2013 (Saint Nicolas).